What was once a lovely tall she-oak tree is currently being chopped and chipped up after the strong winds yesterday. We now have space for a few more fruit trees at the bottom of the garden. 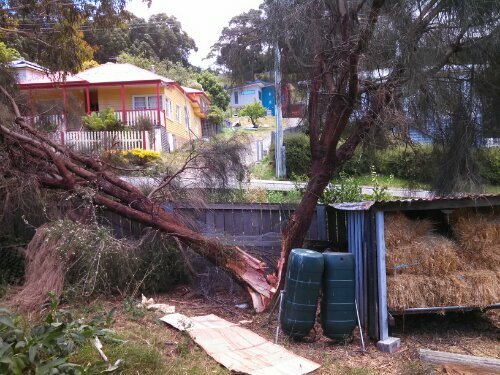 And only a month after we’d relocated the straw shed to take advantage of the shelter the tree offered from the prevailing rain direction. Ah well, at least we won’t have to buy the batch of mulch we had planned. 2013 was an odd year, very little really happened in the garden for a bunch of reasons. My garden plans for 2014 are nebulous so far, just a few ideas about converting more of the veg garden areas over to perennial plantings. It’s nice to be back writing here. This entry was posted in pruning by admin. Bookmark the permalink.